I want to stay with the Hosokawa family a little longer. The aesthetical aspects of Higo-koshirae are discussed quite often and I also dedicated them a chapter in my recent publication Koshirae – Japanese Sword Mountings. In this article, I want to deal with the rather brutal context of some of the well-known Higo mountings. But first some words on Tadaoki´s childhood. He was born on the 13th day of the eleventh month Eiroku six (永禄, 1563) as oldest son of Fujitaka and Jakô (麝香, 1544-1618), the daughter of Numata Mitsukane (沼田光兼) who was the castellan of Kumakawa (熊川城) in Wakasa province. His youth names were „Kumachiyo“ (熊千代) and later „Yoichirô“ (与一郎). Two years after his birth his father Fujitaka was involved in continuous fightings on behalf of the Ashikaga-shôgun and Tadaoki was put in the care of the Hosokawa-retainer Nakamura Shinsuke (中村新助) who lived in a small and inconspicious house outside of Kyôto. It was a life of hiding and when Fujitaka returned from the fightings, Tadaoki was already five years old. Regarding his hot temper there exists an anecdote for the third year of Genki (元亀, 1572) when a dispute arouse between Hosokawa-retainers from the Ueno (上野) and the Arakawa family (荒川). It is said that Tadaoki, nine years old at that time, sided with the Arakawa and drove out the Ueno. Fujitaka was quite angry about that and one year later Tadaoki was put in the care of his uncle Gyokuhô (玉峯) who was a priest at Kyôto´s Eigen´an (永源庵). 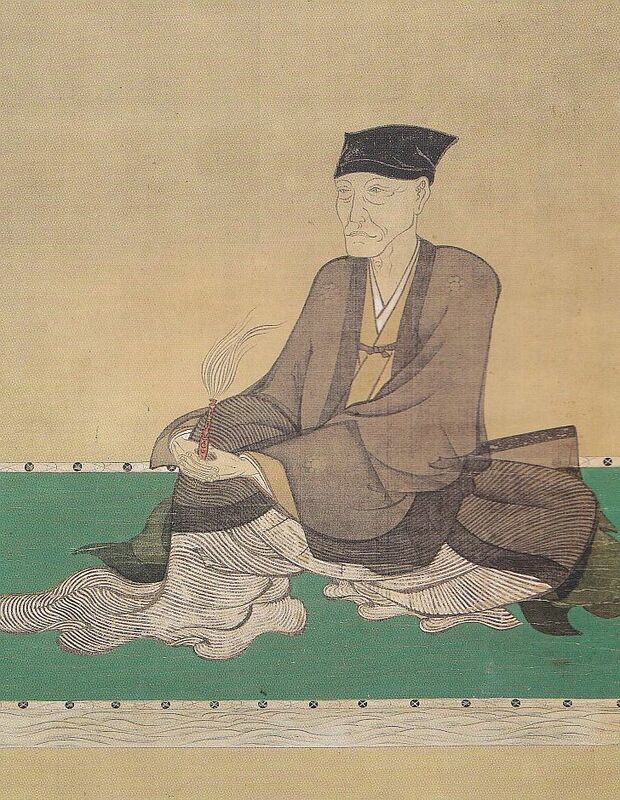 However, it is unknown if this has something to do with the Ueno-Arakawa dispute but we do know that his temper must had been that hot even as a young boy that the chronists found it necessary to record it. His first battle took place in Tenshô five (天正, 1577) when he was fifteen years old. It was in the course of Oda Nobunaga´s subjugation of Kii province. Tadaoki, back then still under the name „Yoichirô“, accompanied the campaign against Kaizuka (貝塚) in Izumi province where they were fighting against troops of the Saiga-ikki and followers of the Negoroji. Shortly later he and his younger brother Okimoto (興元, 1566-1919) were the first to arrive at the rebelling Kataoka Castle (片岡城) in Yamato province. For his achievements during the severe fightings for the castle the young Yoichirô received a letter of acknowledgement from Nobunaga. Well, to go into battle at the age of fifteen was not uncommon for his time but he did especially well and Nobunaga confirmed his vassal-status by granting him the character for „Tada“ from his son Nobutada (織田信忠, 1557-1582). Well, already three years before these fightings Nobunaga suggested that Tadaoki should be married with Akechi Mitsuhide´s (明智光秀, 1528-1582) daughter Tama (玉, 1563-1600) but his father Fujitaka refused because – according to the Hosokawa chronicles – of his son´s „too strong character“ (gôkyô ni suguru, 剛強に過ぐる). However, we all know that the wedding took place, just somewhat later, namely in Tenshô seven (1579), and we also know that Tama was the famous Gracia. By the way, at the time of the marriage Tadaoki received from Nobunaga the kuyô family crest. There exists the anecdote that this was because some years before, Tadaoki or rather Yoichirô had seen this crest on a kozuka of Nobunaga and told him that he liked it a lot. Picture 1: Portrait of Hosokawa Tadaoki by Ôbuchi Genkô (大渕玄弘) made five years after his death. So far the early years of Tadaoki until his marriage. That his hot temper did not stop even in his later years and after being a renowned tea master and student of Sen no Rikyû (千利休, 1522-1591) can be learned from the nicknames of some of his sword mountings. First the famous so-called „Kasen-koshirae“ (歌仙拵, see picture 2). Tadaoki had retired in Genna six (元和, 1620) and handed-over the leadership of the Hosokawa family to his son Tadatoshi (細川忠利, 1586-1641). Twelve years later he moved to Yatsushiro Castle (八代城) where he wanted to spend his last years with tea and the arts. But he was somehow worried about that the politic of his son did not make progress. So he made an example, called for Tadatoshi, and executed 36 criminals with his own sword, a number which reminded him of the so-called „Thirty-six Immortal Poets“ (sanjū-rokkasen, 三十六歌仙), a group of poets from the Nara and Heian periods. So the mounting got the nickname „Kasen-koshirae“. The blade itself is a work of Kanesada (兼定, No-Sada), who was famous for making blades with superior sharpness (see picture 3). Picture 4 shows the so-called „Nobunaga-koshirae“ (信長拵). Well, this one got its name from the blade it mounts and has nothing to do with Tadaoki´s hot temper. But I want to present it here for the sake of completeness as it is very similar in interpretation to the Kasen-koshirae. Nobunaga, the maker of the blade, was active around Ôei (応永, 1394-1428) in Kaga province. Family records of the Hosokawa say that Tadaoki defended his life with this blade during the battles of the Genki (元亀, 1570-1573) and Tenshô eras (天正, 1573-1592). However, as his first battle was as mentioned in Tenshô five (1577), the former can be dismissed but if the transmission is nevertheless true, than he used that blade in his first actions on the battlefield. By the way, it is said that Tadaoki had these subtle and tasteful koshirae made on the basis of instructions of his tea master Rikyû. The so-called „Kishuso-koshirae“ (希首坐拵, see picture 6) has its name from the fact that Tadaoki killed with the sword an impolite and disrespectful Daitokuji-monk (大徳寺) called „Kishuso“. The blade itself is a work of the local Higo smith Fujiwara Nobusada (藤原宣貞) and has a nagasa of 56,5 cm, that means it is an ô-wakizashi. And last but not least there is the nagamaki-naoshi wakizashi by the 2nd generation Samonji (左文字). It is called „Shisô-ken“ (晴思剣) and has its name from killing a spy disguised as tea servant (chabôzu, 茶坊主), on which Tadaoki held a grudge for several years. The legend says that Tadaoki´s mind (sô, 思) brightened (shi, 晴) when he slayed this person. Therefore the name „Shisô-ken“. Often a sword got its nickname from killing this or that warrior in a battle or cutting through helmets, armors, horses or whatever. And koshirae were often named according to their famous wearer, to their magnificent interpretation or fittings they were equipped with. But Tadaoki did not pick the swords with the Kasen-koshirae or Kishuso-koshirae in the morning with killing someone later that day in mind or going into a battle. These were his everyday swords and accordingly mounted in a tasteful and expensive manner. And this demonstrates us on the one hand how hot his temper was and on the other hand that he was truly a warlord born and raised in the turmoils of the Sengoku period.